Just a week after the ‘Mobilegeddon’ shift in Google search engine rankings to favor mobile-friendly sites, comScore released a research report citing that the U.S. had reached a new inflection point—there are now more mobile-only Internet users than desktop-only. Just a year ago, there was still nearly twice the percentage of desktop-only internet users (19.1 percent) as mobile-only users (10.8 percent). 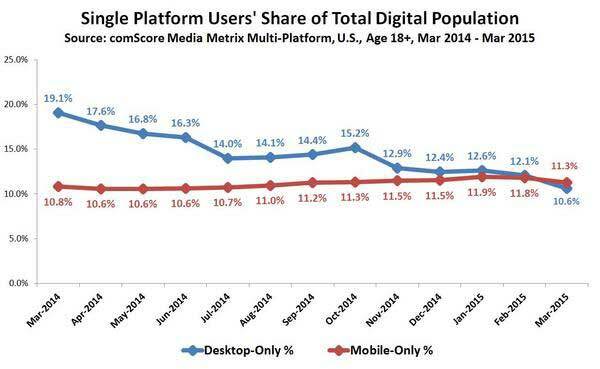 While the share of mobile-only users has climbed over the past year to 11.3 percent, the desktop-only population has drastically declined to just 10.6 percent. Of course these numbers also tell us that the vast majority of the digital population (78 percent) is multi-platform and goes online using both desktop and mobile platforms. While desktops won’t disappear anytime soon, especially for highly complex tasks, mobile and tablet devices are clearly becoming the primary tool for audiences to interact with the Internet and they’re growing more comfortable with complex tasks on the smaller, touch interfaces. So, government agencies should join our friends at the National Park Service and get mobile-friendly fast. If your organization is not already moving swiftly to prepare for a mobile-first and mobile-majority audience, it’s time to start immediate plans to prepare for the future because in many ways, it’s already here.